This image released by Twentieth Century Fox shows a scene from "Alien: Covenant." 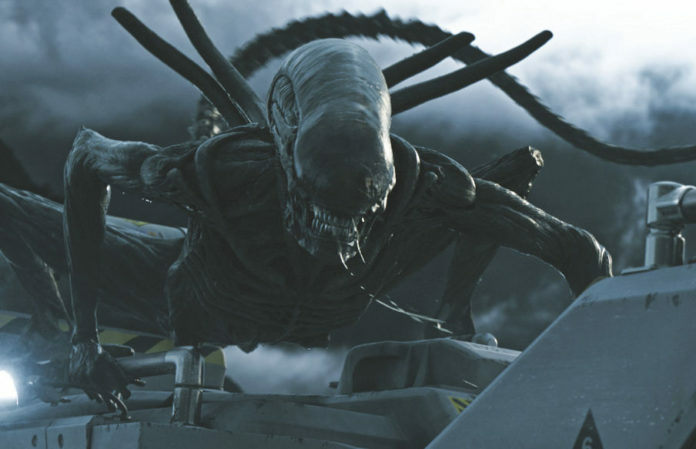 “Alien: Covenant,” formerly “Alien: Paradise Lost,” is awash in religious images and text and symphonies of creation and debasement and destruction. It is an agreement of faith in events past and future, of predestination in the salvation of some and damnation of others, that colors each scene and plot point, as we in the audience are as close to Engineers as director Ridley Scott and screenwriters John Logan and Dante Harper (from the story by Michael Green and Jack Paglen), looking for each minute link to the events of Prometheus before and Alien in the future/past. Will it line up? Will it make sense? Will the actions of this crew lead into the actions of the Nostromo a few decades later? For the most part, it succeeds in convincing us that subsequent crews should really heed the old saying of forgetting the past is dooming it to repeat itself, because the progression of this universe is built upon a foundation of failures and blind ambition. At the end of 2012’s “Prometheus,” sole survivors Dr. Elizabeth Shaw (Noomi Rapace) and the android supreme David (Michael Fassbender), or at least his head, take off from moon LV-223 in one of the Engineer’s ships bound for the beings’ home planet. Ten years later, in 2104, a new crew of dimwits with advanced degrees is aboard a colony ship bound for a remote planet, its cargo holding 2,000 colonists in cryosleep and over 1,100 embryos in drawers way to easy to open and compromise. A new android, Walter (Fassbender again), is a simplified version of David, who was deemed “too human, too selfish, idiosyncratic” by the Weyland Corporation. I’m not sure if Weyland has merged with Yutani yet in this timeline, but the spectre is there and growing widely. If dastardly things start happening on any of these films, the Corporation is behind it with nefarious agendas that usually include weaponizing any evil that is dredged up or fleshed out, literally. Walter makes sure everything is ship-shape on the Covenant while the humans sleep away the years of interstellar travel, until one day the energy-harvesting sails that recharge the ship’s engines are damaged by solar flares, causing a brief system failure. Dozens of colonists die in their incubation pods and the ship’s captain, Branson, (James Franco) is burned alive before the awakened crew can extract him from his. As the distraught crew and their anxious new captain, Oram (Billy Crudup), decide what to do next, there is a “rogue transmission” from a planet in a nearby star sequence. Interestingly, we learn in quick succession that there is “no way to detect spontaneous double flares until it’s too late” (but no one thought to install a backup plan or generator), this mysterious planet is off the charted grid, and the transmission turns out to be someone singing a John Denver song. If even Homer Simpson got the willies at the mention of John Denver in Treehouse of Horror V, we should know that country roads will not take you home unless you live in hell. Still, this crew is plucky enough to suspend their grief long enough to decide to investigate this planet as a possible spot to colonize, as their 5-minute research deems it biologically suitable for humans. Despite years of planning into the other planet, which will take several more years to reach, no one wants to get back into their hibernation pods so they set out. There has to be one Jan Brady, however, and that is Branson’s widow, Daniels (Katherine Waterston), who has that funny feeling that is dismissed as “women’s intuition,” otherwise known as “hesitancy to risk of death.” Naturally, the new captain wants to puff his feathers out as the new leader, so he won’t hear any of Daniels’s protestations of waiting, planning, safety measures, or risk factors. He wants to catch ghosts! Right away, I’m thinking, “Why don’t they send Walter out first and hang back on the ship until he can run some tests on the air, water, and soil?” Or that little robot that accompanies Maggie (Amy Seimetz) to clink around under the landing pod — was he just too precious to send out alone? Why the crew was in such a hurry to investigate a transmission that is obviously not a distress call, nor a warning, was both ridiculous and glaringly unprofessional. The folly of this whole enterprise is that the crews never had an English teacher amidst all those engineers and scientists to analyze the situation for plot holes and determine proper drafts before the final copy. We know where this is going. If “Alien: Covenant” is a Greek tragedy draped in Old Testament retribution, then the audience looks down on the frailty of the humans and their creations from the dais of the darkened theater, grinning and laughing as they walk into their doom one by one. There is never a doubt that every phase of this planet’s rise and fall is a result of intelligent design, but just who is the designer? Enter David again, who has set up shop in the ruins of the civilization that was destroyed (I won’t spill those beans for those who haven’t seen the film) by airborne pathogens similar to the black liquid in Prometheus. For ten years, he has been a combination of Drs. Moreau, Frankenstein, and Jekyll in a laboratory fashioned like a monk’s library and study (kudos to production designer Chris Seagers). As the crew continues to make bad decisions and suffer horrible, yet predictable deaths due to an absolute abandonment of basic protocol such as haz-mat suits and masks, the android’s ulterior motive is revealed to Walter, who not only recognizes David’s superior intellect but also the extent of his ambition. David-as-anti (Antichrist, Antihuman, Anticreator) is only as believable as the fight against him, and there is scant opposition in the Covenant crew, who already have their hands full with aliens exploding out of mouths, spinal columns, etc. The depths of his evil remain unseen, as is the reach and influence of Weyland Corporation. The film ends on a dour note, indicating a forward progress backwards, both dooming us to repeat yet again in the next film and pushing forward to the genius of the original.